At the height of its Empire, Rome became one of the largest, most beautiful and most powerful cities in the world. It contained up to one million people, which was a huge population by the standards of the time. It also contained numerous magnificent public buildings. Most of these were constructed during the early period of the empire. Augustus, the first emperor, boasted that he found Rome a city of bricks and changed it into one of marble. Many visitors to Rome arrived by boat at the port of Ostia. To most visitors it would have been busier than anything they will have experienced before. The writer Aelius Aristides described the scene in the 2nd century AD: ‘So many merchant ships arrive in Rome with cargoes from everywhere, at all times of the year that the city seems like the worlds warehouse. The arrival and departure of ships never stops -it's amazing that the sea, not to mention the harbour, is big enough for all these merchant ships’. ​​​The visitor entered ancient Rome through one of the guarded ‘gates’ in the surrounding walls. These led into the city, much of which was a maze of small streets. Many of these streets contained people selling hot food. They were also littered with all kinds of household waste, which was thrown on to the streets from the street-side houses and apartments. Much of Rome must have been full of many different kinds of smells - not all of them pleasant. The streets seem also to have been very crowded and noisy. A Roman poet Juvenal described it as follows: ‘The streets are filthy and your legs will be plastered in mud. No matter how you try to hurry, there is a great crowd ahead of you and behind you is a mob shoving and pushing.... You will get poked in the ribs by somebody's elbow -and a soldier's big boot is sure to come crashing down on your toe. " As Romans of old walked through some of their streets, they occasionally passed under high stone arches which supported what might appear to be bridges. These were not bridges, but aqueducts. They carried on them thick, cement pipes which brought water from the hills into the city. There were at least nine of these remarkable structures running through ancient Rome. The longest was over sixty kilometres long and all the aqueducts combined are thought to have brought more than half a million litres of water per minute into the city. When the water reached the city, it was stored first in large tanks called cisterns. ​There were hundreds of public bath houses in ancient Rome. Many of these were quite small, but a few were very large indeed. The baths built by one emperor named Diocletian covered over fourteen hectares and are said to have been able to hold three thousand bathers at one time. Both rich and poor people attended the public baths. They went not merely to bathe, but also to meet and chat with their friends, to play games or even to make business deals. The baths usually opened at about ten-thirty in the morning and stayed open until the late afternoon. Entry was cheap and children got in free. You could hire a masseur to give them a massage. In the course of a massage, a special blunt, hooked knife called a strigil was used to scrape dirt and sweat from one's body; which would then be rubbed with sweet-smelling perfumes. Very many Romans enjoyed attending the public baths. But not everybody liked them, as you will see from the account quoted below from Seneca, the famous Roman writer. ​At the edge of the Forum was the Senate House. 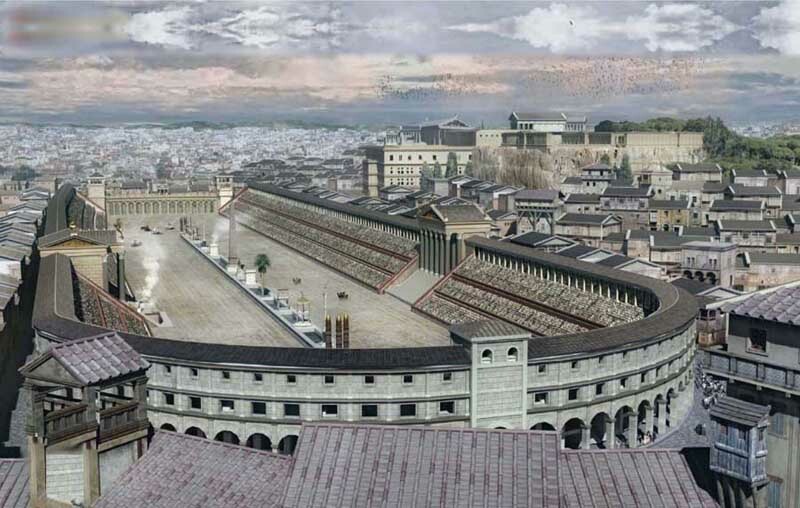 At the centre of the Forum stood a large covered market, at which food and all kinds of household goods could be bought. Through the centre of the Forum ran a road called The Sacred Way Important religious processions passed through here; as, occasionally, did Roman generals and their soldiers on triumphant returns from military campaigns. The Forum was often so crowded with people that there was hardly enough space to move about. But at least the area was free of carts and other such traffic. 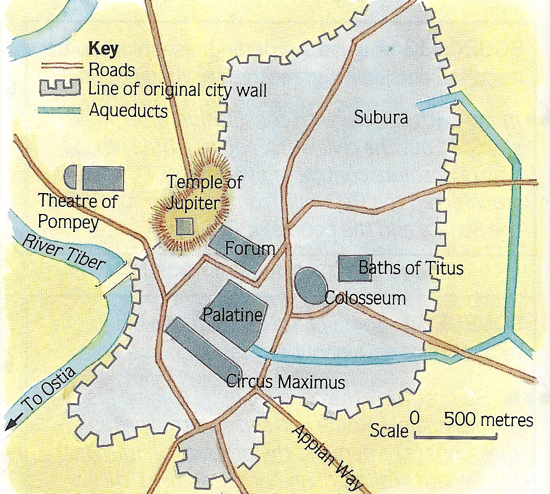 A law during the early days of the Empire made the Forum one of Europe's first pedestrianised city areas. At the edge of the Forum stood a public building next to a huge statue, called "Colossus". Therefore, this building was referred to as the Colosseum, though its official name was Amphitheatrum Flavium, as it had been the Emperor Titus Flavius Vespasianus, who had ordered its construction. 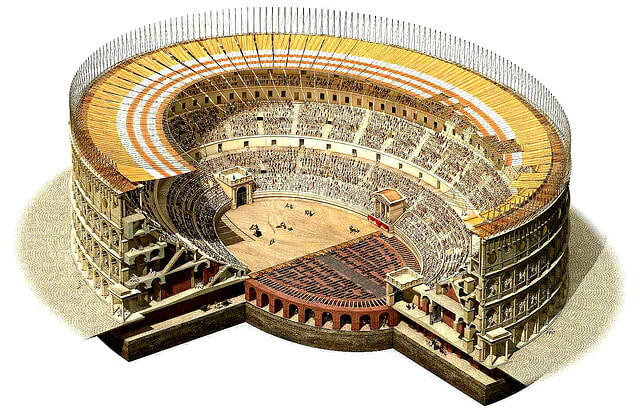 This was the largest amphitheatre in all of the Roman Empire. Like all amphitheatres, it was the venue for public "games", which usually took the form of gladiators fighting each other - and wild animals - to the death. The Colosseum is another reminder of the extraordinary building skills of the ancient Romans. It could hold 50,000 people. All of these could be evacuated in a little over three minutes through eighty separate exits called vomitoria. The floor of the amphitheatre could be flooded with water, so that even mock sea battles took place to entertain the crowd. A huge cloth canopy, suspended on poles from the tops of the walls, was used to shade spectators and performers from the heat of the sun. Not far from the Colosseum was an even larger sporting venue. This was the Circus Maximus, in which up to 250,000 people were known to attend chariot racing - ancient Rome's most popular sport. Everybody from the Emperor to the poorest Roman might attend the races (though of course the Emperor and other important people would have special track-side seats). Unlike in the Colosseum, women and men were allowed to sit together, so it was a good place to go on the ancient Roman equivalent of a ‘date’. But chariot racing could sometimes be rather dangerous - and not only for the charioteers. Different teams of charioteers had fanatical supporters who sometimes fought each other after the races. Accidents could also happen. The worst accident took place during the reign of the Emperor Nero, when a huge section of the tiers of timber seating collapsed. It was said that 1,112 people died in the accident and in the stampede for the exits which followed. The example on the right should give you some ideas about what to say, what you might argue about and how you might dress and add props. Of course, ours will look better because we will film it with a green screen. S3 Rome 2014 from internationalschoolhistory on Vimeo. ​iv. 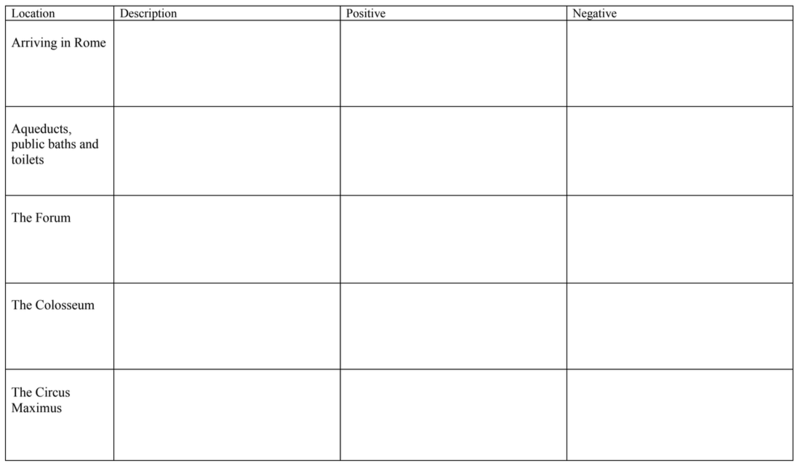 identify different views and their implications.